￼ Seattle is located about 45 minutes from Washington’s Cascade Mountain range that has 10 ft or more of snow on an average winter. This gives local’s easy access to some amazing downhill skiing, cross country skiing, and snow shoeing. So during your stay at a Seattle Bed and Breakfast join the locals and head to the Cascades to play in the snow. Stevens Pass is 78 mile from Seattle over Highway 2, with 10 lifts that service Beginner to Double Black Diamond Trails. Snowshoeing tours are provided along the Pacific Coast Trail. Shuttle service is avaialble from many locations in Seattle. I live to hit the slopes and the back side of the mountain with the open bowls are my favorites. Snoqualmie Pass is 60 miles from Seattle over Highway 90, with 26 lifts that service Beginner to Double Black Diamond Trails, 1,994 acres, and night skiing. Snoqualmie also has cross-country, telemark, and snowshoe center with 23 trails. 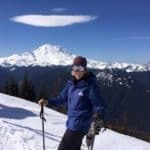 I have been skiing at Alpental for over 30 years, one of the best ski areas in the world if you like it steep, International is over a mile and half long and my favorite. Crystal Mountain is 75 miles from Seattle over highway 410, with 10 lifts that service Beginner to Double Black Diamond Trails. Also available is snowshoe tours. The view from the top of the Crystal Mountain’s Gondola is amazing looking across the valley at Mount Rainier. The gondola runs year around and theres a restaurant at the top so you might want to take in the view over lunch. Mount Rainier National Park is 99 miles from Seattle on Highway 7. Park Rangers lead 2 hour snowshoe walks every weekend. The guide is free and snowshoes are provided.